Is LottoPoint a Scam or Legit? Read 2 Reviews! What do you think of betting on lotteries versus purchasing lottery tickets? 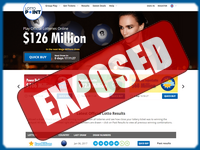 LottoPoint (former Lotto365) is an online betting site for international lotteries for both individual ticket and group play. All you have to do is complete your virtual lottery slip to play. They name Emirat AG, a company out of Germany, as their insurer to guarantee your winnings. So, let’s take a look. To place your bet on a lottery, players simply complete a virtual play slip. There are 22 international lotteries offered at LottoPoint.com including the usual mega lotteries of US Powerball and EuroMillions. You can choose to play a single ticket line or more. There are discounts for choosing multiple draws including 7% for 2, 10% for 4, 8% for 15, and 30% for unlimited. There isn’t any information on what happens if you opt out of the unlimited – for example, do they readjust your discount if you decide to leave say at 5 draws. If you are more interested in syndicates, LottoPoint has group play for each of the lotteries offered. Players can purchase up to 100 shares per syndicate. There are 233 tickets in each syndicate with numbers randomly chosen. 200 people can participate. Note the different use of the terms shares and people. Theoretically, if each of the 200 people took 100 shares each (not that they probably would do this) then any winnings would be split by 20,000. I say theoretically, as I can’t imagine everyone purchasing 100 shares, but it certainly dilutes any win. First-time players get 100% back on their first purchase, plus a free ticket (no info on what lottery). That also goes for subscriptions where your first re-billing period is free. Then there is the “Sweet Deal Specially” which is the deal of the week plus it looks like other bonuses once you are registered. Oh – and of course the usual VIP club though there is no information on it until you register. If you bet on that winning jackpot combination, the jackpot prize payout is the officially published amount. If there are winners in the official lottery and in LottoPoint, then the jackpot is divided by the total number of winners. For all other prize levels, the payout for each winner is the same amount as published in the official lottery. Hang on, then the terms and conditions say that if the total number of winners is higher than the official winners, then the winning amount will be divided up by the total prize pool of the winners at that level. Getting your winnings from LottoPoint seems fairly straightforward. Prizes tier 3 and lower will be transferred into your account. Prize tiers 1 and 2 involve a claim form plus a certified copy of your passport/ID document and then you will get your money 30 days “after the claim form is submitted, processed, verified and approved”. Lottopoint.com takes no commission but does point out there may be third party costs/commission to transfer your money. You can’t play at Lottopoint.com if you are a citizen or resident of the United States of America, Republic of Bulgaria or State of Israel. Okay, here’s where it gets interesting. You also can’t play if you are a citizen or resident on a list published by the FATF (Financial Action Task Force) or currently listed on the financial sanctions list of HMRC (not sure what the acronym is but it’s the Consolidated List of Financial Sanctions Targets in the UK). Haven’t seen either of those before! You also have to 18 years of age or older. LottoPoint offers a snail mail address and phone number in Bulgaria, and a bunch of other phone numbers for Canada, Australia, Ireland, and South Africa. There is also an email address, online form, and live chat. The live chat seems to be 24/7. Lottopoint.com is operated by Global Gaming Leader NV Ltd. which is regulated by the Curaçao Gaming Commission. Our team got a big hung up on the time frame of when you’ll get any jackpot win. The other thing was the ratio of shares in their group play. LottoPoint gets a grudging thumbs up especially for their communication options, but we are still laughing over the ratio on their group play. I am from Australia have bought a $356 dollar package in January which should last till June/July, this is from so-called Canada, and the managing director called Emma, then I was given a guy who just cut media had an enquire about my so-called winning tickets every week, every week them I get the results it is always numbers in their 40, not one number in there 40 in my winning tickets, is this a set up? I was reading along thinking this is a great online lottery provider and then I got to the bit about the shares in their syndicates. What a riot. The potential of 20,000 shares of 200 tickets is a joke. It totally defeats the concept of buying in to a group. I wonder how many shares are usually purchased.